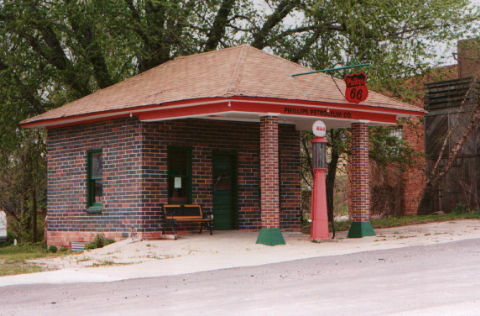 Old Phillips 66 gas station museum in Massena, Iowa on the north edge of the business district on Hwy 92. Some Phillips artifacts inside. Reportedly open 2-5 Wednesday and 10-2 Saturday. 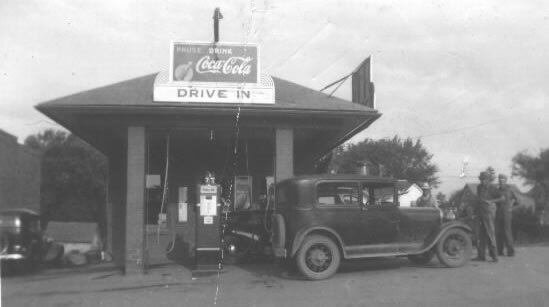 Has a visible pump out front and a hanging Phillips 66 sign. Located in Southwest Iowa one half hour south of I-80 near the Atlantic, Iowa exit. Harry "Buzz" Brower posing in 1940, proud of his new electric gas pump. A hand pump is partially visible behind the electric pump. There had been two hand pumps at one time. One for regular and one for ethyl. Kerosene and oil were in containers inside the station. On the left side of the picture, you can see a cage in the background. He had a fox, raccoon and pigeons (The local "Zoo" ). Buzz moved to California during WWII and opened a Hancock station in L.A. after the war. 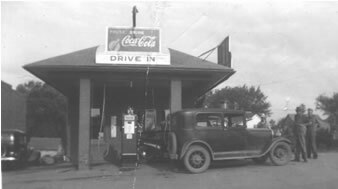 Below: The Hancock gas station at 52nd and Normandie St. in Los Angeles, California, 1946. That's Buzz with his hand on his hip near the outdoor lift. How about those visible pumps and electrics both in use! The garage in back is a separate business.